Los Angeles knows how to Halloween, with the season picking up as soon as summer ends. Perhaps you’re skittish and would like to just visit a nice pumpkin patch and get a cider. Or perhaps you’re a masochist who is ready to be hooded and manhandled in the dark. We’ve got a Halloween event for each and every one of you, and we’ll be adding more as details become available or as sold-out events (looking at you, Delusion) hopefully release more tickets. Even if you haven’t been following along with The Tension Experience’s alternative reality game in which they slowly reveal the secrets of the mysterious O.O.A. Institute, you can still enjoy this totally bizarre 24-room haunt from horror movie director Darren Lynn Bousman and writer Clint Sears. Each guest will have to interact with dozens of actors, solve puzzles and make choices that will alter the path they take through this unsettling 2.5-hour experience. (Running until at least late November; check the website for current details and dates). Last year's Creep had guests encountering human monsters, who whispered deranged secrets and made visitors hide in a claustrophobic box from a demon. If that sounds like fun to you, then get ready: this year's show explores the mind of a tortured artist who disappeared nearly 30 years ago. Get a drink in their lounge, then enter their twisted maze in groups of only eight at a time, for 90 minutes; get reservations in advance to prevent long waits. A half-dozen mazes, numerous scare zones, roller coasters in the dark, and spooky performances will take over the park for Halloween this season. New this year is Aftermath 2, the park’s largest maze in history, which takes place in a post-apocalyptic world where a group of villains seek to unleash a deadly virus. And as the holder of the DC Universe license, they’re also launching a Suicide Squad scare zone this year (even scarier: sitting through the movie). 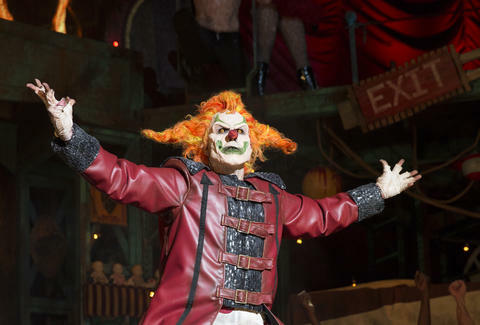 Knotts’ long-running Halloween experience is back with eight mazes, two of them new, plus zombie laser tag, a virtual-reality horror experience, an augmented reality game, and four bonus immersive horror experiences for people who splurge and buy a pass with a skeleton key. (Which we’d recommend unless you love waiting in lines.) As you move from maze to maze, monsters will try to sneak up on you within each of their foggy scare zones. 17th Door goes beyond the traditional haunted house with their story of Paula, a troubled college student who has basically every issue after-school PSAs cover. If you're not cool with gross-out horror or potentially triggering subject matter (eating disorders, sexual assault, bullying, etc. ), we'd avoid this one. Otherwise, expect a dozen totally new rooms, a mini-escape room, and roving pig demons in this half-hour-minute haunt. The monsters can and likely will touch you (not violently), but it comes with a safe word if you get too scared. This annual haunt is always enhanced by the fact that some people truly believe the ship is haunted. They’ve got six mazes this year, including the new Intrepid, where you’ll be introduced to the ship’s creator, The Iron Master, plus paintball, sideshow performances, a 4-D maze experience, and the themed bars like the Voodoo House Bar & Tasting Room. Mr. Bones Pumpkin Patch returns to Culver City with pumpkins for purchase as well as a straw maze, crafts, a petting zoo, a bounce house, pony rides, photo ops, and other family-friendly (and tabloid-friendly -- celebs are often pictured here getting ready for the holiday) fun. This daytime event at the zoo has got a corn maze, puppet shows, crafts, animal feedings, and a cave experience with shadow puppets, as well as up-close experiences with snakes, scorpions, and spiders. Each Halloween, Unbound Production’s Wicked Lit offers an immersive performance of classic horror tales at the very scenic and seasonally appropriate Mountain View Mausoleum and Cemetery in Altadena. This year’s three short plays include H.P. Lovecraft’s From Beyond, Anansi and the Demons, and Ellen Glasgow’s The Shadowy Third. Head up to Griffith Park to take a hayride through the grounds after dark. Last year’s Boogeyman theme has been replaced with Secret Society, wherein members of a clandestine cult with judge you as either “Elite” or “Deranged.” This is also the first year that guests will depart the wagon and travel some of the pathway on foot. In addition to the hay ride, there are will as be a few additional mazes, the Scary-Go-Round, pumpkin carving, and a food truck. To walk through the Thousand Oaks fave Reign of Terror is to wind through 95 rooms, all with different horrifying themes (Mental institutions! Zombies! Zombie mental institutions!!). Tickets are cheap, so this Thousand Oaks haunt is the best bang for your buck in town, plus you can feel good even while feeling terrified: all the proceeds go to charity. Once you enter this Fullerton haunt, the spirits inside will chose one of four paths for you, each leading to a different horrifying dimension. As you navigate each realm, look out for an entity called a Brander, who may mark you for all eternity. Depending on what sort of ticket you buy, you can experience just one world or all four. From Psycho, to Motel Hell and From Dusk Till Dawn: the motel has always held a special place in horror. Anaheim's Motel 6 Feet Under is a clever haunt with some cool special effects that manages to be family-friendly, while still suitably spooky. This theatrical haunt requires you to first navigate a maze, then witness several garish and extreme vignettes in their black box theater. This one is excellent every year, with truly disturbing and well-crafted performances, and it’s only $15. This haunted house invites you to relive the bloodshed that occurred at 821 Hyde St on November 1st, 1959. The backstory is that a little boy who grew up loving Halloween was driven to madness and murder after some pranksters tried to spoil his seasonal fun. Unknown horrors wait inside the 2,500sqft maze, just waiting for unsuspecting revelers like yourself to stop by. You can choose one of two ticket types: one will ensure the monsters don't touch you, but the other allows the monsters to touch you, pick you up or move you around. There are five new mazes to explore at this annual stadium haunt: Insanity, Illusions, Descent, Inferno, and Hunted. Illusions is a half-dark, half-3D maze meant to distort and confuse, while Hunted has you attempting to escape a malicious entity that wants to make you its prey. Additionally, they have an attraction called The Last Ride, which will apparently show you what it'd be like to be buried alive in a coffin. Good thing they serve beer! Actors won't touch you, but they might get close. Throughout October, you’ll be able to check out a horror art show at Think Tank Gallery titled Trap House. Monster busts, gory paintings, and macabre sculptures take up the gallery space, but if you’re feeling extra brave, you can try their escape room. It’s a 30-minute experience that takes place in the recording studio of a GG Allin-esque punk musician who harbors a very dark secret. There’s also a lounge sponsored by Sailor Jerry rum in the back. The art show is free; the escape room is $35. This short immersive performance from Force of Nature lacks the bells and whistles of some of the big names like Delusion and Tension, but hey, it’s only $15. A creepy mortician will introduce you to a few of his pals before leading you down a monster-filled hallway to a seance. Here, the medium enlists your help as she attempts to free trapped spirits from the mortuary grounds. You can make a day of it by stopping off at Halloween Town first for any last-minute costume or decor needs, as it’s just a short walk away. Rockwell Table & Stage will present a musical parody version of Hocus Pocus, the 1993 Disney flick about three treacherous sister witches and the havoc they wreak upon Salem. You must be 17+ to attend, and there's a two-item minimum. It’s just like any other speed-dating event, except that some of the participants will have a dark, possibly deadly agenda. So, basically it’s just like any other speed dating event. Guests will mingle for 30 minutes before going through Trap House’s escape room (mentioned above). The singles will also get to vote on who they think the secret serial killer is. Singles who guess correctly will win a prize, although any single who is guessed to be the killer and isn’t wins “a crappier prize.” Admission includes a beer or cocktail, plus the escape room. The event on the 16th is geared toward heterosexual singles, while the 23rd is LGBTQ. Gorlesque’s Paradise is part-maze, part sultry burlesque performances. The 20-30 minute experience will rely on mind-altering special effects to unsettle the senses as you explore the vision of a mad scientist who dreamed of creating the perfect woman. Beware the Dark Realm is a Santa Clarita haunted maze that takes place in a medieval castle full of ghosts and ghouls. It’s free, so long as you bring a can of food for the SCV Food Pantry. If you’d like the non-scare version of the castle, you can show up at 6pm. But after 7pm, it’s ‘boo’ time. This favorite homemade haunt has been in business for over 20 years, taking place each year in the Meyer family’s own yard. This year's theme is the Not-So-Enchanted Forest. It's free, though they do accept donations for charity so throw 'em $5. They work hard on this! E.P. & L.P. are throwing a Stranger Things-themed Halloween bash Friday, October 28th through Monday, October 31st. Enjoy special cocktails like The Upside Down (rum, Citron Sauvage, passionfruit, pineapple), '80s jams, and immersive decor. Get a rare look at the exterior sets and stages where horror classics like The Exorcist and The Lost Boys were filmed, then settle in for a horror screening complete with movie theater snacks and beverages. On Friday, October 28th, the film is The Conjuring. On Saturday, October 29th, the films The Conjuring 2. You'll also be able to check out horror props from the two films at the studio's immersive “Stage 48” attraction. On October 29th, put on your Sunday worst and partake in the Santa Monica Zombie Crawl. Urgh and Argh your way from the Santa Monica Pier in search of nearby food and drink specials. And if you’re bad at applying your own ghoulish visage, makeup artists will be at hand to help you get gruesome. The one-night only Witches' Ball takes place in a secret location near Downtown LA and is full of surprises, including an immersive scare zone and a host of burlesque and vaudeville performers, as well as a promised appearance from the Devil himself (so Donald Trump will be there? We kid, we kid... ). And, of course, there’s a bar, serving up all your favorite libations, plus craft cocktails via Stolen Rum. Danny Elfman and original Nightmare Before Christmas cast members Catherine O’Hara, Ken Page, and Paul Reubens will, with the help of a live orchestra, sing their way through a screening of the animated cult classic at the Hollywood Bowl, which will be extra Burton-y with photo ops, costume contests, and trick-or-treating stations throughout. A live orchestra will accompany the classic 1922 vampire film, F.W. Murnau's Nosferatu, presented at the Ace's gorgeous theater. While much of the original score has been lost, a chamber orchestra and LA Opera's Matthew Aucoin will give it a new one. Alone returns for a single night this year, October 30th. Previous performances have had us crawling around in the dark and dancing with anthropomorphic strangers, but this event seems to depart from the maze tradition. This year’s ritual takes place an unknown location, only to be disclosed to ticket holders, at 9pm. According to Alone: “The Enola Foundation is gathering its members to perform and participate in a ceremony signaling the onset of the Anthropocene epoch, the converging period of geological time where humans exert the dominant influence over the Earth’s ecosystem." This gigantic street party happens every Halloween from 6pm until 11pm, with lots of bar hopping afterwards. If you don’t mind crowds, this is the biggest yearly Halloween event in Los Angeles, attracting 500,000 spectacularly costumed revelers. Vintage Enoteca, 7554 W. Sunset Blvd. If you’re an adult, you can do the mature thing and pair your Halloween candy with wine. At Vintage Enoteca's 7th Annual Candy & Wine event, you'll get your own bowl of treats, including Sour Patch Kids, Skittles, Milk Duds, and more. These will pair nicely with the four wines they’ll give you to try throughout the evening. Eliza Deckard is a reclusive Los Angeles journalist who has never said the safe word.